Just 15 minutes a day of creative play can increase your ability to find creative solutions to the some of the dilemmas that you are facing on your homestead. Creative play rewires you brain — enhancing the snapses between your left brain and your right brain, helping you to get rid of some “cobwebs” that stymie your problem solving abilities. So while it might seem silly to play with colours, textures, and patterns, your brain is working while you play. Try it for 30 days. Sometimes we all need to play. 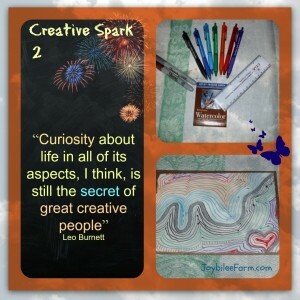 What is a Creative Spark? Creative sparks are 15 minute exercises, that use materials that are either inexpensive or already around your home. They give you structured play to strengthen your creative thinking and enhance your JOY. If you are homeschooling invite your students to play with you. You can do it with a group of friends and share your sparks online. You can share them on my Facebook page under the daily Sparks post. You can take a picture and share them with your friends. Draw a random, swirly line in the middle of your paper – diagonal lines are more interesting than horizontal. When you have covered your paper with parellel lines, take one dominant line or three dominant lines and outline them with your metallic marker for interest. Frame your drawing by outlining the card/paper with your gold Sharpie. Take a picture and share on my Facebook page.